Every once in awhile, when my beloved wife, Lee sees me staring into space and tapping my foot against my desk, she chirpily asks, “Why don’t you write a blog”. Though I can remember when writing a blog was maybe the most fun a human being could possibly have, there is a merciful part of the universe that helps humans forget most of the details of that part of our lives. Ok, sure, I still like writing blogs, but now I am tapped to remember the stories behind my cartoons. At fifty-nine, I’m lucky to even remember what a cartoon is, much less the fact that I remember that I am a part of creating them. Not all cartoons are necessarily meant to be funny. They can purvey irony, sadness, frustration and a myriad of other emotions (if they are good at all). Though I never know for sure during the creation of our cartoons, I do know how things feel to me when they happen. I suppose if I still lived in my birthplace when the government closed, I would barely feel it. It has a few federal buldings, I think a federal court and a post office and since the post office is only quasi-governmental it stayed open. But I live in a small sleepy tourist town that relies totally on the National Park Service and when Congress closes it for nearly 15 days, you better believe everyone in our little hamlet feels it. Our water fountain was closed. That doesn’t sound serious but it is the only free water fountain in the world (just a few blocks from our home) that serves the best and healthiest water in the world. Elvis, who could afford any water in the world chose ours and had 50 gallon jugs shipped to Graceland every month. The water is magnificent. We were reduced to “spring water” from who knows what kind of stream at the grocery. Our water we know stays under the ground at 2000 degrees and does not see daylight until the day it is retrieved. It runs across thousands of crystals and precious gems, absorbing well-known and very rare minerals that heal the body’s ills. We drink about a half gallon per day. It’s that good. People drive from miles around, from different states in vans and pick up trucks and back them into the water fountain parking lot and get in line. Thanks to the GOP Congress we couldn’t get our own water. We were unable to hike our own National Park trails. All our public baths/messages and such were closed. Places every major celebrity and President visited often for healing. More importantly the prices were kept low so everyone could afford it from any station of life. Our whole city with all its businesses rely on that park, those baths, that water etc. To think that a few political loonybirds who happen to be public servants decided they felt the Affordable Care Act, already a law okayed with the quite conservative Supreme Court “was no good” that we the people needed to be punished. I hope they know we’ve got memories and our memories kick in the most lucidly at the voting booth. If its any consolation, there is plenty about Obamacare of which I don’t like, but…I’m an adult; I don’t like stop signs or traffic lights but I stop at them; and I don’t ask to close the government because they didn’t ask me first (of course I wasn’t born yet when that bill passed to put stop signs, then later traffic lights up) but had I been born, you better believe I’d be raising hell to get them off my street corner. Stop signs look like anemic loitering ne’er do wells standing in cahoots with some traffic cop just waiting for us not to totally stop. How UnAmerican. Just a few months after the Statue Of Liberty was re-opened due to the destruction from Hurricane Sandy, which, by the way the southern red states voted not to help them, but a few months later when a brutal wedge tornado hit my hometown of south Ms, the northern blue states had the money there before they could even ask. The Statue Of Liberty is special to me for a number of reasons. The laws regarding immigrants are not working. If anything, they should be the laws that do work the best, and committees and experts on it every day to make sure immigrants arrive safely and get into the system from the start. We all came from immigrants, like it or not. If we met many of our ancestors from 3,4,5 or even 10 generations before us, we’d have to speak a form of sign language unless we both understood each other’s language of their homelands. My ancestors were early settlers from Spain and Portugal. They worked hard, very hard and did well. One of them, a great great x10 or so maternal aunt or cousin was poet Emma Lazarus whose last verse of her poem “The New Colossus” appears above the door of Lady Liberty, “Give us your tired, your poor, huddled masses, yearning to….” Etc. She meant that. It meant a lot to her. She showed it to her mentor Ralph Waldo Emerson who thought very highly of it. Even then, they knew that if this country was going to be as special as our Founding Father’s vision of it was, we would have to insure that immigrants arrive and arrive safely, and treated well after their arrival. It appears many have forgotten what this country is all about. They surely don’t know what makes America special. Some do know but pretend they don’t. They need to re-assess where they learned that, take a look at the Statue Of Liberty or even read the entire poem “The New Colossus”, and then let us know what they’ve learned. Lady Liberty sits on Ellis Island which is one of America’s most famous National Parks. It was closed due to Congress’ shenanigans. Rick London is an author, designer, songwriter and cartoonist. 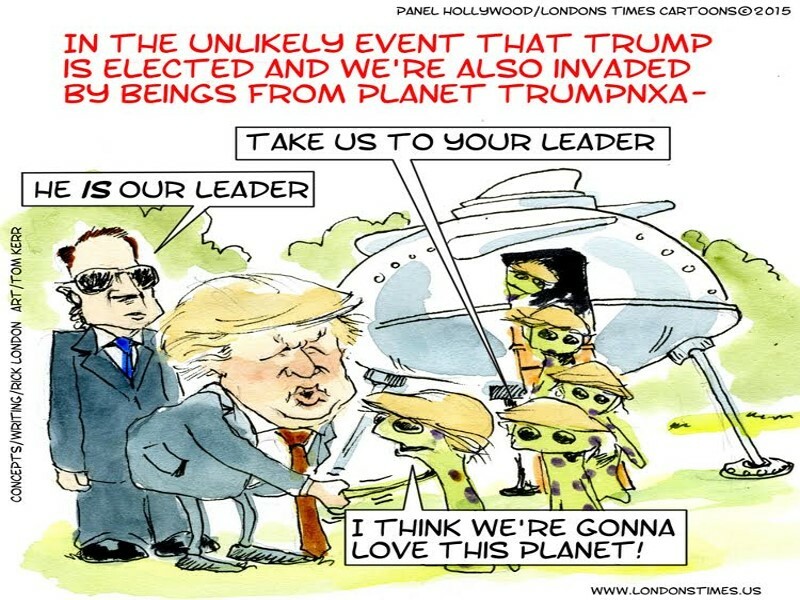 He is best known for his Londons Times Cartoons by Rick London, which has been Google #1 ranked offbeat cartoons since 2005. 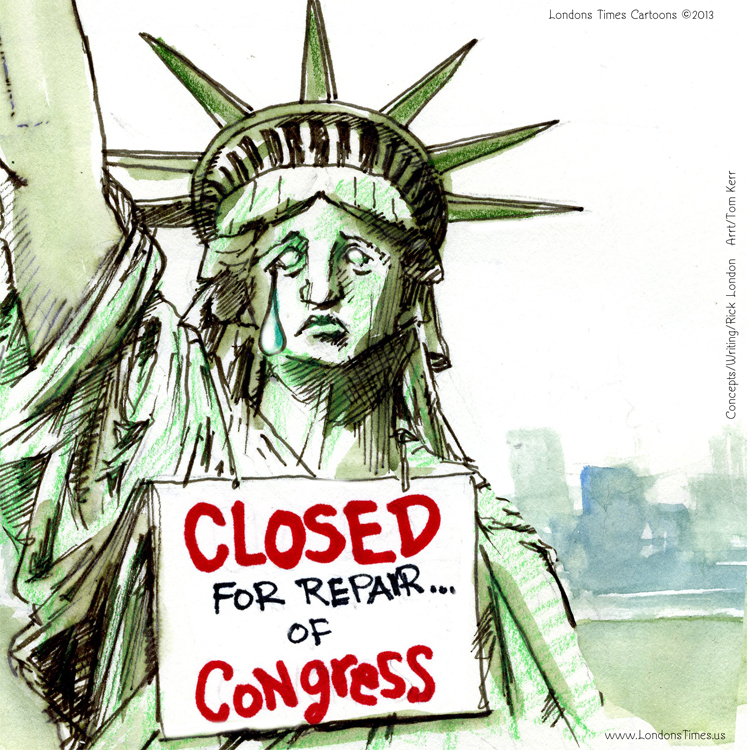 London has created dozens of products from funny tees to offbeat aprons bearing this Government Shutdown Cartoon. London is married to popular wildlife/nature photographer Lee Hiller-London whose blog Hike Our Planet is visited often.